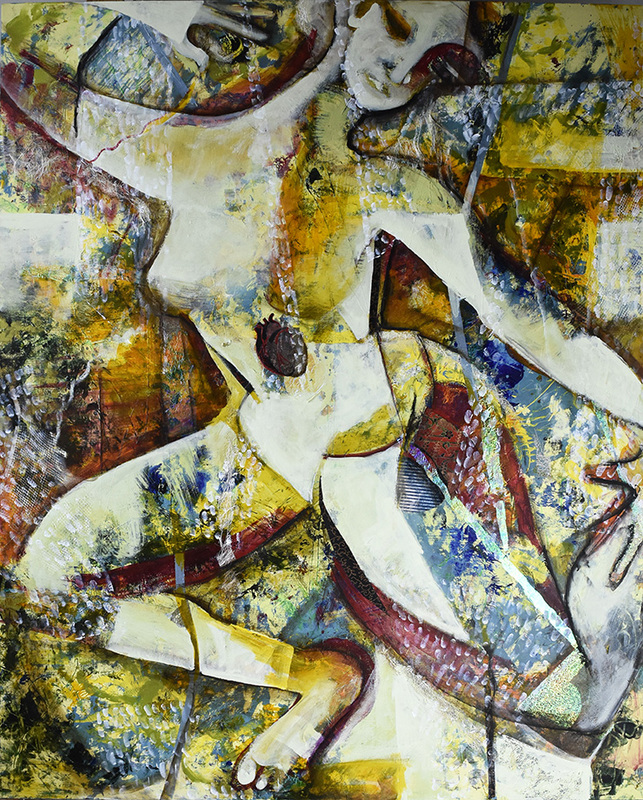 Uprooted - Mixed media painting by Susan Krieg - 36"x18"
Many artists get to a point where they feel tight in their work and need to loosen up. I started out as an abstract painter in the 1970s. By abstract, I mean strictly non-representational. Pure, in the moment, self-expression was my goal and I felt like I was actually creating something from nothing. As time went on, I got tighter and more careful, due partly to my attempts to design something representational for the design industry, due also to my narrow vision about how something should look, a lot due to the criticism from art galleries and even more due to self-criticism. 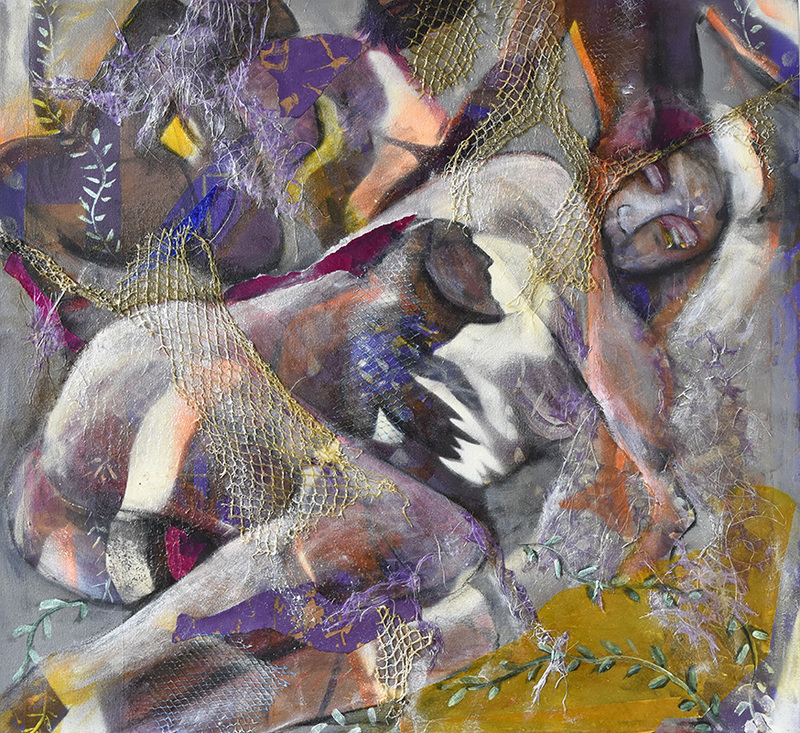 Getting tight and being careful is understandable when it’s your job and you’re expected to perform, but at some point it becomes almost impossible to break free from self-imposed constraints, when all you want to do is sit down and paint freely again. Okay, that’s where I was in October 2017 when we moved to Alexandria Virginia. My dog had died in July 2017 and I felt so sad but couldn’t even express my sadness emotionally on canvas without being tight in my representation. See previous post The Story Behind Kuan Yin Contemplates Attachment. 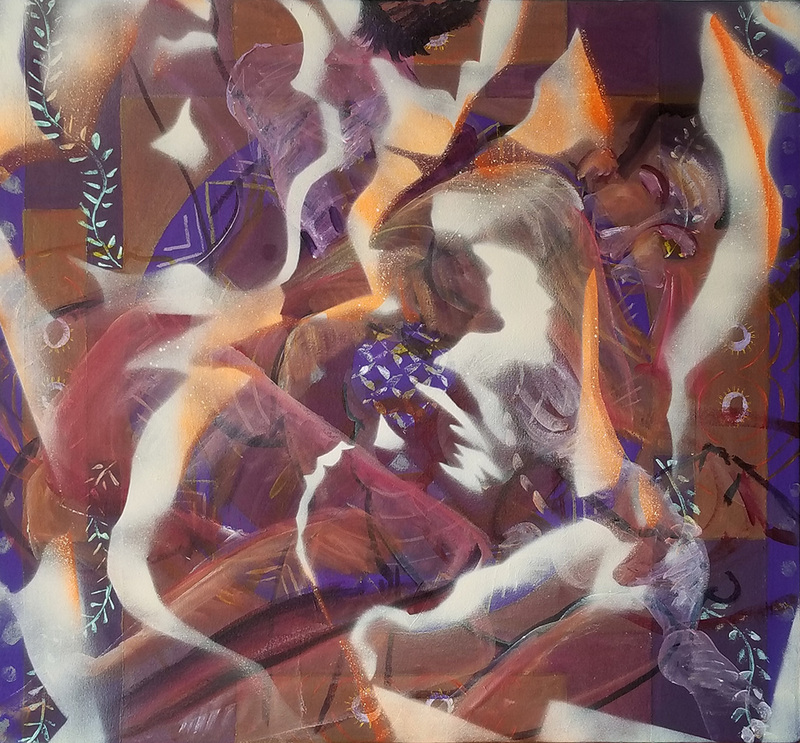 The first painting is titled ‘In Dreams We Heal’. Still feeling pretty tight and a bit afraid of the canvas I decided to get rid of the white canvas and start with a structure. Using the concept of a mandala, I started with some basic symbols that represented the earth mother….. In Dreams….in progress. 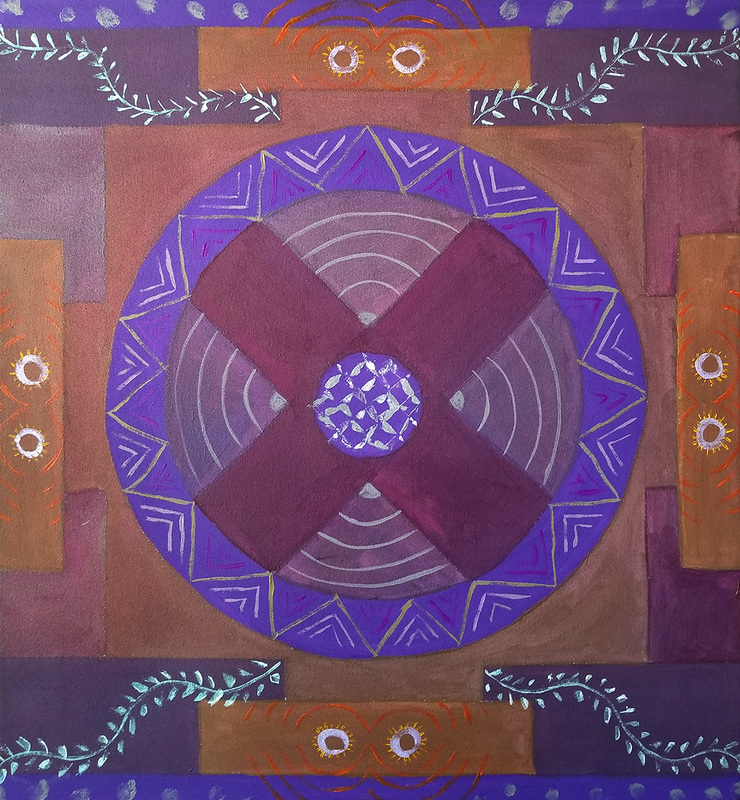 Began with a mandala idea. On top of this I painted directly from the model onto the canvas…. I cut out stencils from smaller figure sketches I had drawn, spray painted around the stencils and made a total mess…..
Spray painted around small stenciled figures. At this point, someone who saw the painting said, “I liked it better before you did that”. I laugh now, but that was that echo of the past criticizing the risk I had just taken and I knew I had to push on and keep risking. I continued to develop the figures that were there and glued additional papers and materials onto the surface. It was a breakthrough dealing with criticism, frustration and fear of failure. The next painting is titled ‘Uprooted’. This one had been on my mind while I was packing to move and brooding over all the moves I’ve made in my life. I had pictured it originally in a very structured way representing the earth and a woman pulling her own feet up out of the ground. While I was looking through my photographs, I came across a model I had used for a previous painting that I had titled ‘Garden Camouflage’. See previous post about Garden Camouflage. It’s still one of my favorite paintings and you can see it has the representational style I had developed over many years. To me it’s a beautiful representation of the lovely model. In my new painting however, I wanted to show the angst I felt in moving. I needed to lose the figure in the abstraction of the circumstance, tying together the physical, emotional and everything else I felt. Can you tell that it’s the same model? The third painting is titled ‘ Something into Nothing’. The image came to me while I was meditating. I’m a big fan of Joe Dispenza. I’ve been using his meditation tapes first thing in the morning. I was inspired by the thought of seeing some thing become no thing, whereby I visualized a quantum physical unraveling of my physical being. Instead of trying to manifest something on the material plane I enjoyed the experience of expanding my being into pure thought. This one was a joy to paint. I know how hard it is to break from self imposed limitations and to think bigger and express who we are in whatever fashion feels right. So, what was the purpose of all this breaking free and abstracting? I think, so that when I go back to painting beautiful portraits that require care and technique and focus, I am still able to bring passion and joy into the process. Thank you Preston. I always appreciate your comments.